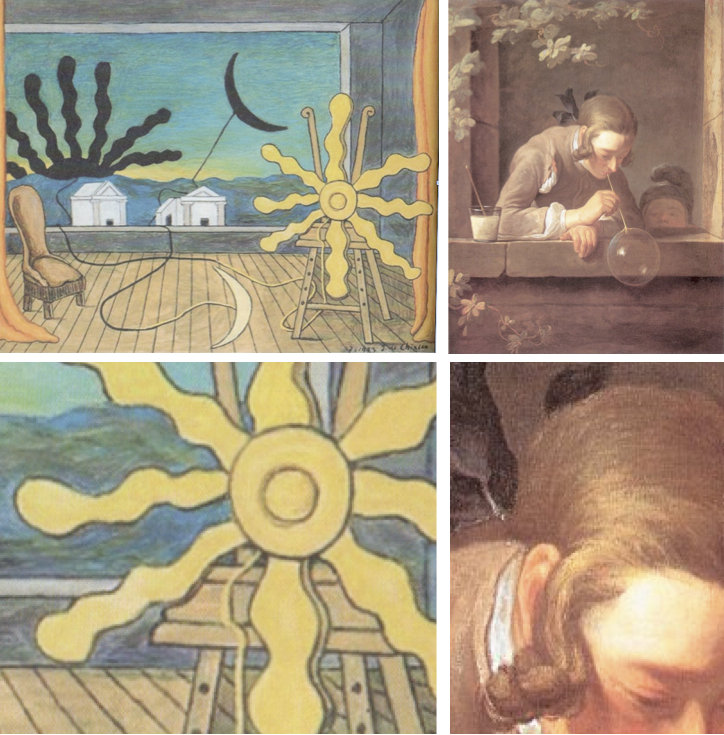 The meaning behind De Chirico’s late painting, Sun on the Easel (upper left) is discussed in Part One, while another version of Chardin’s Soap Bubble (upper right) is discussed in a separate entry as well. Please read those articles first. 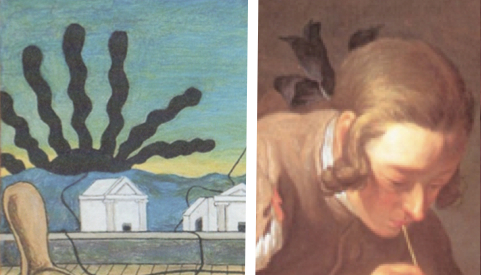 Here I want to show how De Chirico’s composition is a metamorphosis of Chardin’s, of which several variations exist. This one is in the National Gallery of Art, Washington. Both, as already demonstrated, are about art. 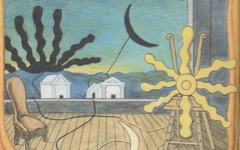 The first link between the two images is the boy's blond lock (lower right.) 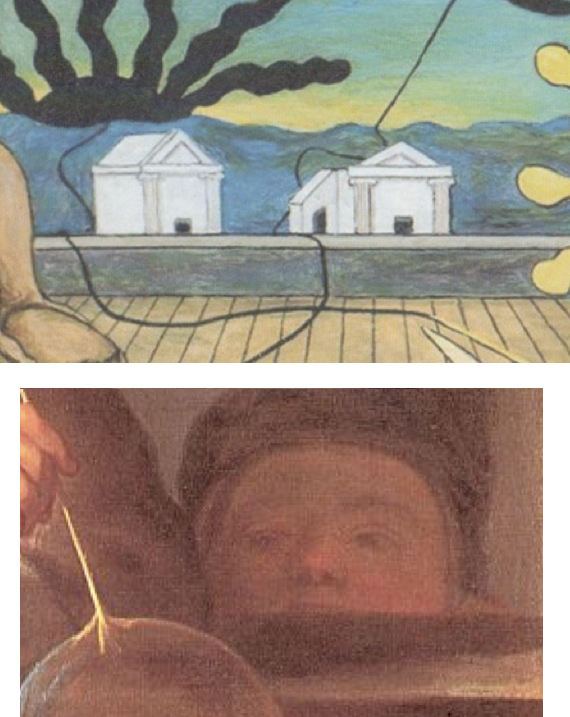 It has become the multiple yellow rays of the sun on De Chirico's easel (lower left). Chardin's youth (upper right), as shown before, is a representation of a generic great master carefully applying paint to canvas. Thus De Chirico, in placing multiple metamorphoses of the boy's lock on his easel, has painted "the multiple minds" of great masters. The lock, after all, grows out of the boy's "mind"/head. Chardin's child peering over the desktop is "Chardin" himself, reborn, ready to follow earlier great masters. Picasso used to say that, when painting, he could feel the great masters looking over his shoulder1; here it is the other way around. In recognizing that Chardin’s figures represent great masters, De Chirico fused the boy's lock with the black bow behind his head and turned them into the plume-like rays of the black sun. 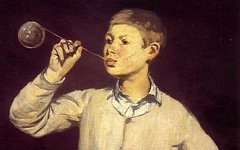 The circular shape of the boy’s head (the artist's mind) is reflected in the circle of the black sun, just as it is in the yellow sun. Underneath, darkened entrances into two temple-like buildings resonate with the eyes of Chardin's child peering over the edge of a table. A doorway is a liminal point between one space and another, one reality and another, which is why the noun, entrance, derives from the verb, to entrance. An artist's eyes are the entrance to his soul. The straight black string attached to the black moon is a metamorphosis of the yellow stick and bubble of the youth. De Chirico's studio, with its sharply receding side wall and slight ledge below the window, is a reflection of Chardin’s image with its own sharply receding side wall and stone ledge. Even De Chirico's yellow curtain reflects the sunlight on Chardin's wall. Given these links, the shape of De Chirico’s chair on the left is probably an echo of the glass of liquid on the left of Chardin’s image with a stick inclined at the same angle as the chair's back. Chardin’s stick in a glass of liquid represents "a brush in a pot of paint" while De Chirico’s chair represents "the absent artist." 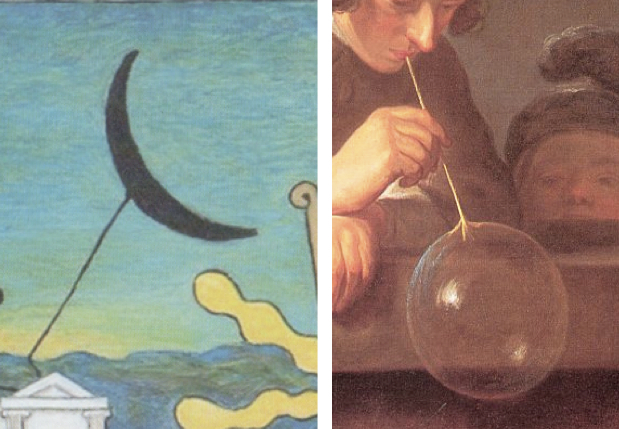 De Chirico clearly thought, like us, that Chardin's Soap Bubble was an image about making art. 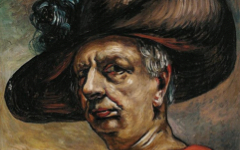 The painting was also of such importance to the elderly De Chirico that he turned its forms into a complex and profound meditation on the creation of art. This form of metamorphosis between one seemingly unrelated image and another is far more common than anyone has ever noted in print, partly in fear perhaps of derision from colleagues. It is time, though, that this method was taken seriously. Just as a composer transforms the melody from a century-old concerto into a modern symphony so too do artists manipulate art's forms into new and original compositions in tune with their time.2 An introduction into the theory behind this technique can be found in Simon Abrahams' short article How Forms in Art Work. 2. James R. Gaines, Evening in the Palace of Reason: Bach Meets Frederick the Great in the Age of Enlightenment (New York: Harper Collins) 2005, pp. 126, 130, 232. Original Publication Date on EPPH: 19 Jun 2011. © Simon Abrahams. Articles on this site are the copyright of Simon Abrahams. To use copyrighted material in print or other media for purposes beyond 'fair use', you must obtain permission from the copyright owner. Websites may link to this page without permission (please do) but may not reproduce the material on their own site without crediting Simon Abrahams and EPPH.